Reflections of a Newsosaur: Want to save your local paper? Read this first. If you think life would be sweet if the profit-oriented corporations running newspapers were replaced by wealthy, civic-minded people operating them in the public interest, consider the case of the Berkeley Daily Planet. Then, think again. 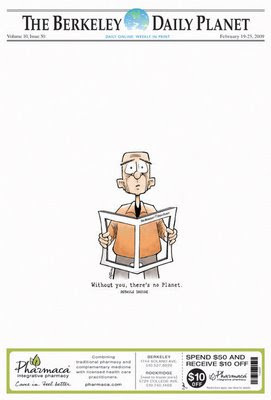 Three weeks ago, the Daily Planet, which distributes some 23,000 free papers each week in Berkeley, CA, ran an arresting front page to kick off a PBS-style pledge drive to help offset the $3 million in losses suffered by the local couple who bought the paper six years ago to save a major source of news about their community. Becky and Michael O’Malley, long-time Berkeley residents who made a tidy $15 million when they sold their software company in 1996, purchased the Daily Planet at a bargain price when it was sold during the break-up of the venture-funded firm that founded it. The O’Malleys, who Michael says have an “average age of 70,” never intended to make the Daily Planet into a big business. Although they say they would have been content to operate the paper on a break-even basis, the business lately has proven to be to be far more challenging than they had imagined. With interest rates dear and sales weak, merchants have little extra money to spend on advertising. In fact, one of the paper’s biggest and steadiest advertisers, a holistic pharmacy (remember, folks, this is Berkeley), abruptly went out of business a few weeks ago. Another major problem, said Michael, is that newspapers “have talked themselves into a hole.” He believes newspaper advertising has fallen out of favor among merchants as the result of incessant media coverage of the problems of the newspaper business. With the economy souring and losses mounting, the O’Malleys have begun wondering how much longer they can support the Daily Planet. The couple is well enough fixed that Michael says they probably would have paid as much in taxes on other investments as they have lost to date on the Daily Planet. Before walking away from the newspaper, they decided to see how much public support they could muster to help offset its losses. In the last three weeks, the couple said, the Daily Planet has raised $12,000, including some individual donations as high as $500. “The response is a lot better than I would have predicted,” said Michael. Still, it is only 0.4% of the couple’s loss. One alternative before walking away from the paper would be charging something between $1 and $2.50 for a paper that until now has been free. This is really interesting. It's become all too easy to think of newspapers as some strange hybrid of passionate journalists attached to the head of an aging (and somewhat demented) corporation. I hope you'll follow this tale, and let us know if the fundraising works (or what type of approach works if it comes to that) and the choices that have to be made along the way. This is enlightening. Is going online-only an option for this organization in this community? Although I know Alan isn't a big believer in this model as well - it is another drop in the bucket and I suspect if they put up a link to this on the Berkeley Daily Planet they'd be more likely to get a donation than if they just put up the blanket call for donations they have up right now. And of course, I must post a comment encouraging these good folks in Berkeley to look outside the box of the simple NPR/nonprofit model and take a look at the L3C - a social enterprise hybrid limited liabilaity company — that makes it easier for foundations to make program related investments. I've written about it at the Huffington Post Chicago, here http://tinyurl.com/bunlt2 and here http://tinyurl.com/cperkw. I have more to learn about L3Cs but I like what see because it is not about perpetual begging, even though NPR makes that honorable. .
Having read this paper since it started under the previous owners, and been involved in many of the stories the current owners have covered I have a slightly different view of their plight. One that's further complicated by their editorials haranguing local companies for not advertising in their paper. As a friend of mine succintly stated they confused a "newspaper" with a "journal of opinion." Consequently they have only covered the comments and votes of City meetings they agreed with, they've constantly denigrated public officials who don't share their view of the world without any attempt to interview those people, and they've run this paper as their personal political megaphone. Hence they've driven away advertisers who might now be revenue for them. And driven away readers who want a balanced view of how our City's business is actually conducted. Of course, they are not the first publishers to have this problem. Just our local latest. That sounds exactly like most big papers. Are you sure this isn't The Dallas Morning News? They have done tremendous damage to other newspapers. By subsidizing the partisan Planet, they severely undercut both the independent UC Berkeley-student-run Daily Californian (now struggling, see recent USA Today article) and independent, feisty East Bay Express. This was a vanity project from the start. Truth be told, so is the Chronicle (for Hearst). Like your blog Alan but you've picked the wrong mascot here. PS Both the Express and Daily Cal must fund their operations ENTIRELY from advertising. The Express no longer has New Times to subsidize/ruin it and the Daily Cal gets no university subsidy and in fact pays big rent. Es una pena que este tipo de periódicos locales esté a punto de desaparecer debido a la crisis económica. Acabará con todo lo bueno, me temo.